Perfect position for a relaxing holidays, just over 100mm from the beach. 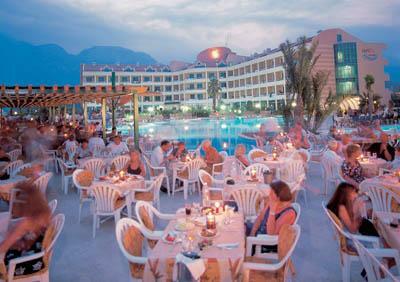 The resort centre Kemer is just over 10 km away and easy reached by local dolmus. The Antalya airport is just 40 km away. Reception (safety deposit boxes chargeable) * restaurants * bars * outdoor and indoor swimming pool * children’s pool * water slide. 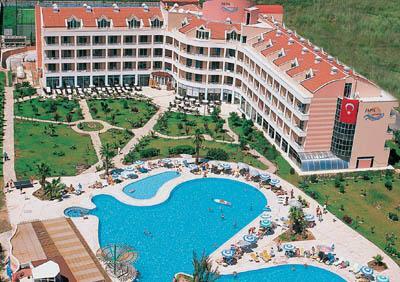 Fitness * Turkish bath * sauna * jacuzzi * table tennis * tennis * mini football * childrens playground * game room. Imported beverages * fresh fruit juice * room service * beverages at the beach disco * bottled beverage * massage * billiards * lightning of the tennis court. The sandy/pebbly beach is just 100m away. Sunbeds and umbrellas free of charge.